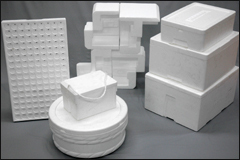 We can process and mold all kind of resin beads made of expandable plastic foam products (EPS,EPP,EPE). Cushion design, 3D modeling, aluminum molds for prototypes and mass production tools. Using our own molding machines (Peony System), we can achieve the highest efficiency and productivity for the production of packaging for electronic products, construction blocks, and Fish Boxes. We also have environment friendly plastic products made with corn.